Beastly Special Edition including Lindy’s Diary, now available. Or purchase the Lindy’s Diary e-book in bookstores or online. 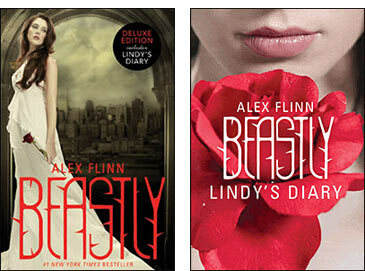 See the #1 New York Times bestselling story Beastly through Lindy’s eyes! This is her diary, kept while living in captivity with the beast. Lindy’s Diary captures all the romance and edgy mystery of the original! I am locked away . . . with no one to confide in but you . . . and him. His fur, those claws—they caught me off guard at first, but now I’m noticing something else about him—something deeper. It’s the look in his eye. It tells me he’s got a secret to keep. That’s okay—I’ve got one, too. I think I’m falling in love with him. . . .
#1 New York Times bestseller, now a motion picture from C.B.S. Feature Films! Mr. Anderson: Welcome to the first meeting of the Unexpected Changes chat group. Mr. Anderson: Anyone here? Or should I say, anyone going to admit being here? Mr. Anderson: Hello? I see you there, BeastNYC. Want to introduce yourself? BeastNYC: Don’t want to talk 1st …… anyone else here? Mr. Anderson: Yes, we seem to have a lot of lurkers who joined the chat before you. BeastNYC: Let them talk 1st then. Mr. Anderson: Anyone else want to give a shout-out to BeastNYC? SilentMaid: Hello, BeastNYC. Should we call you Beast? Mr. Anderson: Thanks for speaking up, Silent – pardon the pun. What sort of creature are you? SilentMaid: A mermaid. Just a little one. Mr. Anderson: You were transformed into a mermaid? SilentMaid: Actually, I’m currently a mermaid, but I’m *considering* a transformation. I thought this group might help me make my decision. Mr. Anderson: That’s what we’re going to talk about tonight – the experience of transformation, how you became what you are. Froggie: wer u trnsfrmd, Andy? Mr. Anderson: Well, no. But I’ve set this up to help you all. SilentMaid: Beast, yes, I am. I’m thinking of becoming a human girl. Mr. Anderson: Froggie, I’ve studied your type of case. Extensively. I’ve written a thesis on The Effects of Transformation on True Love, based upon the works of Grimm, LePrince de Beaumont, Aksakov, Quiller-Couch, and Walter Disney . . .
SilentMaid: Beast, I’m in Denmark. Actually, the Atlantic Ocean, near Denmark. Froggie: Frgve me asking bt is hard typin w webbed fet. SilentMaid: Denmark. It’s in Europe. Mr. Anderson: Understood, Froggie. I think it will be good for you guys – and girl too – to get together and chat. Grizzlyguy: I want to talk about these 2 girls I saw. BeastNYC: I know where Denmark is. Since the curse, I’ve had lots of time to study, cuz I have no life. Mr. Anderson: Good observation, BeastNYC. We’ll also discuss the lifestyle changes brought about by transformation. SilentMaid: Yes, it is. <grin> But it’s warm under the water. Grizzlyguy: I want to talk about these 2 girls! Grizzlyguy: These 2 girls – 1 is Rose Red & she’s really hotttt!!! SilentMaid: Sort of single, Beast. I think I know where this is going . . . .
Grizzlyguy: Not *that* Snow White. A different one – Rose Red’s sis. Quiet. She’s nice 2. BeastNYC: Thing is, Silent, I’m looking to meet a girl, a girl who could love me. SilentMaid: Flattering, Beast, but I’m in love w/ another. There was a boy on a sailboat. I saved him from drowning. Mr. Anderson: Can we not *all* talk at once? BeastNYC: But we don’t have anyone 2 talk 2 usually. Froggie: Lnly being a frg when ur not rlly 1. Mr. Anderson: Understood. Still, we need to take turns so the threads aren’t too confusing. This is the first session, so I thought we’d discuss how we got the way we are – how we were transformed. Froggie: Thts ez – pissed off a witch. SilentMaid: Considering a deal with a witch, here. Sea Witch, actually. My voice for human legs. That’s why I’m Silent. BeastNYC: U type great, Silent. SilentMaid: Thanks, Beast. I have fingers, not claws. Mr. Anderson: Beast, why don’t you tell us about your transformation? BeastNYC: I don’t feel like it. Mr. Anderson: You’re among friends, Beast. Grizzlyguy: Yeah, go ahead so I can talk about the 2 girls. BeastNYC: You know *2* girls, Prince??? Where are *you* located??? Mr. Anderson: This isn’t a dating service, Beast. BeastNYC: Yeah, well I could use one. It’s hard meeting girls when you look like Chewbacca! And I need to meet 1 to end my curse. Mr. Anderson: You need a support network too. That’s why I set this up. SilentMaid: Please, talk to us, Beast. You’re among friends. BeastNYC: All right, all right. The first thing you need to know about me is, I’m a beast. Mr. Anderson: No flames, Froggie. BeastNYC: Yeah, right. But there was a time when I would have said about a fat girl, “She’s a beast.” I’m not a beast like that. I’m an animal. Fur, claws, you name it. Everything about me is an animal, except the inside. On the inside, I’m human still. BeastNYC: It’s really hard for me because before I was a beast, I was . . . well, beautiful. Cool, popular, rich. Like, my friends at school, they’d elected me their prince. BeastNYC: It’s a long story. Mr. Anderson: We have nothing but time, Beast. Talk to us. BeastNYC: <sigh> OK. It all started because of a witch. I could feel everyone looking at me, but I was used to it. One thing my dad taught me early and often was to act like nothing moved me. When you’re special, like we were, people were bound to notice. It was the last month before the end of ninth grade. The substitute teacher was giving out ballots for spring dance court, something I’d normally have thought was lame. “Hey, Kyle, your name’s on this.” My friend, Trey Parker flicked my arm. “No duh.” When I turned Trey’s way, the girl next to him – Anna, or maybe Hannah – looked down. Huh. She’d been staring at me. I examined the ballot. Not only was my name, Kyle Kingsbury, there for ninth grade prince, but I was the sure winner. No one could compete with my looks and my dad’s cash. The sub was a new one who might still have been under the mistaken impression that because Tuttle was the type of school that had a salad bar in the cafeteria and offered courses in Mandarin Chinese – i.e., a school where the serious money people in New York sent their kids – we weren’t going to bust on him like public school dregs. Big mistake. It wasn’t like anything the sub said was going to be on an exam, so we were trying to figure out how to make reading the ballot and scratching in our choices take the entire fifty minute period. At least most of us were. The rest were texting each other. I watched the ones who were filling out their ballots, glancing over at me. I smiled. Someone else might have looked down, trying to act all shy and modest, like they were ashamed of having their name there – but it doesn’t make sense to deny the obvious. “My name’s there too.” Trey flicked my arm again. “Hey, watch it!” I rubbed my arm. “And that’s wrong?” I grinned wider, to bug him, and gave a little wave like people in parades. Someone’s camera phone snapped at just that moment, like an exclamation point. “You shouldn’t be allowed to live,” Trey said. “Why, thank you.” I thought about voting for Trey, just to be nice. Trey was good for comic relief, but not too gifted in the looks department. His family were nobody special either – his dad was a doctor or something. They might post the vote totals in the school newspaper, and it’d be pretty embarrassing for Trey if he came in last or even didn’t get any votes at all. I never asked him again if he loved me. I knew he’d told the truth the first time. I folded my ballot over, to keep Trey from seeing I’d voted for myself. Of course, I knew he voted for himself too, but that was different. That’s when a voice came from the back of the room. “Maybe someone left a booger under her desk,” Trey whispered. “Was it you?” I said. “Disgusting,” the voice repeated. I stopped talking to Trey and looked at where the voice was coming from, this Goth freak sitting in back. She was a fat chick, dressed in the kind of flowing, black clothes you usually only see on witches or terrorists (We don’t have uniforms at Tuttle. It would piss off the parents, not to be able to buy Dolce & Gabbana) and her hair was green. Obviously a cry for help. Weird thing was, I’d never noticed her before. Most people here, I’d known my whole life. “There is something wrong with this world.” She stood like she was making a speech. “Something very wrong when it’s the twenty-first century and this type of elitist travesty is still being perpetuated.” She held up her ballot. People giggled. I started at my name. I was sure I’d never seen her before. But of course she knew me. Everyone did. Probably had some pathetic crush on me. Beastly. The word was from another time and place. It made me think of fairy tales, and I felt this weird tingling, like the hairs on my arms had caught fire from her eyes. I brushed it off.